Growing plants in a greenhouse is an excellent option for the small organic grower. Because the growing area is enclosed, it's possible to manage soil, water and potential pests much more closely than in the outside garden. Because they are protected from excessive rain and wind, and therefore nutrient leaching and plant damage, greenhouse plants are likely to be healthy and productive. I currently have carrots, beets, and bunching onions in raised beds in my greenhouse. These crops will stay there until harvest in June. I have also started broccoli and cabbage seeds; these seedlings will be transplanted to the outdoor garden in mid-April. The hardy broccoli and cabbage seedlings will be able to survive with just row cover protecting them at that time. One of the secrets to successfully growing plants in a greenhouse is to prepare your beds properly. Here's how I do it to ensure a good crop and reduce future work. 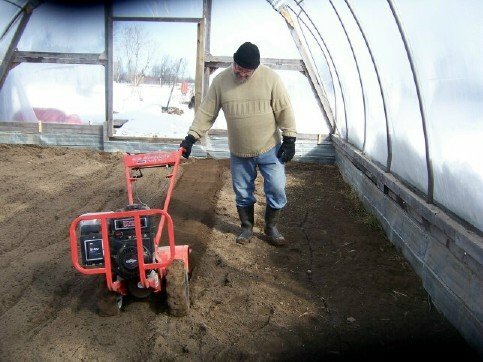 When the ground is thawed, till or dig the soil to a depth of 8" to 12". Important Note: If you are running a rototiller in your greenhouse make sure there is PLENTY of ventilation. I leave both doors open when I'm doing this, for cross-ventilation. Shape your raised beds, leaving adequate path space. I also leave a spot inside each door so I can step in and out easily. When I form the beds for early-season growing, I rake the soil away from the sides of the greenhouse, leaving a gap of 16-18 inches. This is so the growing bed is not in direct contact with the cold sides. Add any soil amendments e.g. organic minerals, compost - you plan to use, and rake in to incorporate into the bed. Water the beds lightly, and cover with row cover. This step is important: by watering and covering the bed, you will encourage weed seeds to sprout before you plant. After about 10 days, remove the row cover and use a flame weeder or collinear how to remove the weeds, without disturbing the soil too much. Plant your seeds into the clean seed bed, water in, and cover again with the row cover until germination. Once the early crops are harvested or transplanted, you can add some compost to the beds and plant later crops. For example, when my broccoli and cabbage seedlings are transplanted to the outdoor garden in April, I can replant those beds with tomato, pepper and cucumber transplants that I grew in my (smaller) heated greenhouse. Depending on the crop, the 'workflow' of plants might be from heated greenhouse to unheated high tunnel, or heated greenhouse to the outdoor garden, or unheated high tunnel to the outdoor garden. The secret to efficient growing is to figure out the sequence that works best in your circumstances, for each crop.